Brilliant Richard Bradley in lights-to-flag victory. 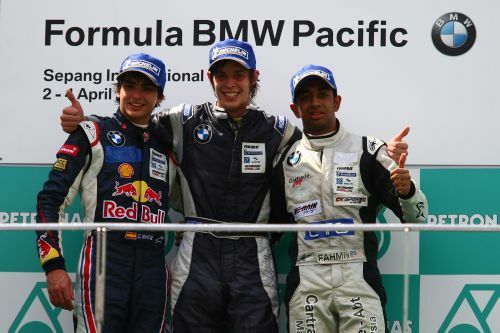 Rookie Richard Bradley (18/SIN/Eurasia Motorsport) scored an emphatic win in the opening round of the Formula BMW Pacific 2010 season at Malaysia’s Sepang International Circuit today, with a faultless run from pole to chequered flag. The UK-born Singapore driver got a superb start off the line, thanks to a ‘secret’ starting technique he had practiced only once, and never looked back, building up a comfortable lead at the front and controlling the race for the full 10 laps. Formula BMW Junior and guest driver Carlos Sainz Junior (15/ESP/Eurointernational) also didn’t put a wheel wrong on the way to second place in his first Formula BMW race, but was never able to seriously challenge Bradley. Malaysia’s Fahmi Ilyas (18/MAS/E-Rain Racing), who made a last-minute team switch on Friday and finished 3rd in the Rookie Cup last year, took the final podium place. Bradley leads both the Driver Classification and Rookie Cup standings after one round and, with guest drivers ineligible to score points, Colombian teenager Oscar Tunjo (Meritus) is 2nd in both. Eurasia Motorsport leads the Team Classification, one point ahead of Meritus. Tunjo, who had been 3rd fastest in the earlier qualifying session but was later penalized for an on-track incident and demoted to 8th on the grid, charged through the field to finish 4th overall and 2nd in the Rookie Cup. Best Formula BMW Pacific Junior was Jordan Oon (19/AUS/E-Rain Racing), 10th overall and 5th in the Rookie Cup, made an impressive debut and had been up to 6th overall before an error resulted in a spin. A superb qualifying session by fellow Junior Kotaro Sakurai (15/PHI/Eurasia Motorsport) saw him start from the 2nd row of the grid. The Japanese driver held his position until lap 6, when an error saw him spin out of the race. Bradley charged off the grid from pole, with Sainz, Sakurai and Michael Lewis (19/USA/Eurointernational) hot on the chase. Tunjo had already begun his charge through the field, and was up to 6th by the end of the lap 3. He took the chase to 2009 Formula BMW Junior Axcil Jefferies (15/ZIM/Motaworld Racing) on lap 8 and the pair locked wheels, with Jefferies spinning and dropping back to 6th behind Lewis. Jefferies then tried to hold off Dustin Sofyan (15/INA/Meritus), who started from the 4th row, but the Indonesian dived past on the final lap to take 6th. The Zimbabwean crossed the line in 7th, just ahead of rookie Afiq Yasid (18/MAS/Meritus) who impressed having started from 14th. The record, 25-strong field impressed in the first race of the year, with a clean start off the grid and 20 crossing the finish line. Early casualties were Natasha Seatter (17/MAS/Petronas Mofaz Racing) and guest driver Hannes Van Asseldonk (18/NED/Motaworld Racing). Formula BMW Pacific Sepang results Results – Round 1. 1.Richard Bradley (21); 2. Oscar Tunjo (15); 3. Dustin Sofyan (12); 4. Axcil Jefferies (10); 5. Afiq Yazid (8); 6. Nabil Jeffri (6); 7. Jordan Oon (4); 8. Chang Mun Shien (3); 9. James Birch (2); 10. Jess Dixon (1). 1.Bradley (21); 2. Tunjo (15); 3. Yazid (8); 4. Jeffri (6); 5. Oon (4); 6. Chang (3); 7. Birch (2); 8. Dixon (1). 1.Eurasia Motorsport (28); 2. Meritus (27); 3. Motaworld Racing (13); 4. Mango Asia (8); 5. E-Rain Racing (6); 6. Atlantic Racing Team (4); Petronas Mofaz Racing Team (1). Strong international entry for 2010 season.